According to the team, "We came here to observe not to monitor. Sometimes, people call us monitors but we just came here to observe the elections. We are at the commission today to listen to you, the commissioners, whatever you have to tell us in preparedness of the commission to conduct these elections. "Then after that, we disperse, we deploy the commissioners to almost many places in the country. We cannot cover every place in the country. It's a huge country." According to him, "The last Commonwealth Observer Mission had recommended that we should abolish that system, that archaic system, that, as citizens or voters are accredited, they should be able to vote at the same time and we have implemented this recommendation way back in January 2016 when we conducted one of the governorship elections in this country. 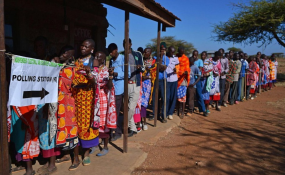 "Since then, we have conducted 194 off season elections and all have been conducted on the basis of simultaneous accreditation and voting or what you call continuous accreditation and voting. "It didn't require an amendment to the electoral legal framework for the commission to continue with the system of accreditation and voting. "For that reason, the commission used it's powers under the electoral act to make Regulations and Guidelines. It's now in regulations for the conduct of 2019 general elections. The method of voting will be continuous accreditation and voting.